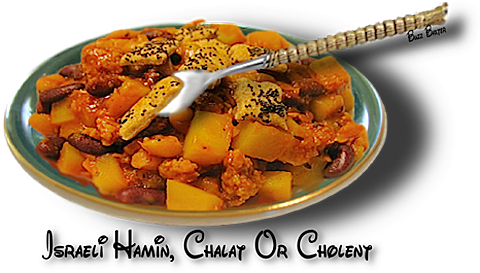 Called either hamin, chabat or cholent, this stew is made from boneless beef or poultry with vegetables and beans. Before modern stoves, it was slow cooked over a very low fire, so no flames could be seen during Shabbat or "Shabbāth", the Hebrew word for Sabbath. Depending on the thickness of the stew, it is served in either a soup bowl or a dinner plate. A very popular dish for Shepardic Jews, in Israel and Eastern Europe, and less popular in other parts of the world. ●  1½ lb Boneless beef chuck; cut into 4 equal pieces,  boneless, skinless chicken breasts or lamb chunks. 1. Soak the beans in water to cover overnight. 10 hours or more. Do not disturb in any way. 4. Serve the cholent in soup bowls, adding a little hot chicken broth, if you wish.